The soul associated with karma is impure and is in a perverted state. The pervertedness appears as a structure (virtual) in the soul. This structure of the soul has not been studied analytically. An attempt is made in this paper to present a model of the cognition process of the soul which enables to analytically describe the concepts like perception, intelligence, buddhi, mind, ahamkara and emotions (bhava). The approach opens up a new field of analytical study of the soul. The soul is a substance having two important characteristics, consciousness and upayoga (manifestation of consciousness). Consciousness manifests as attributes, two important attributes are jnana and darsana. Two other terms intelligence and knowledge have now come in vogue in modern philosophy. Many scholars use the term knowledge for jnana but these two are thought to have different connotations. Cognition, meaning knowing and perceiving, is application of jnana and darsana attributes of consciousness. Consciousness may be interpreted both as a structure and a function of the soul but upayoga refers to the functional side only. In the absolute sense the soul can only be conscious of itself, because it alone exists as that state of pure singularity. When we say ‘it is conscious of itself’, we separate the intellectual level into two aspects: (1) the aspect that it is observer and (2) the aspect that it is observed (although they are one and the same). Intellectual examination, in fact, reveals the existence within consciousness of three values, inherent in any process of conscious experience or any process of observation: (1) the observer, (2) the observed, and (3) the process of linking the observer and the observed. Even though there is nothing but one consciousness, this principle of three emerges. Consciousness being awake to itself experiences itself, and is at once the knower, the process of knowing, and the known- observer, process of observation, and observed; or subject, object, and the process of linking them. In this state of absolute consciousness, these three values are one and the same, yet they represent these aspects of the same singularity. It is obvious that every relative experience requires a subject coming together with an object. This coming together takes place both on the level of attention as well as on the sensory level of perception. When the subject comes together with the object through the process of observation, then the experience occurs- then knowledge of the object by the subject takes place. Knowledge therefore, is the result of the coming together of the observer, the process of observation, and the observed. As one consciousness leads to three aspects, the interaction between the three and the resultant aspects, relationships, and their interaction, etc. leads to an infinite number of ever-expanding possibilities. All these possibilities, all these forces of interaction and relation, exist in the soul. The interaction of forces, even though within the soul, creates a dissymmetry, as if a distortion, in the flat and homogeneous- yet infinitely flexible- absolute singularity of soul. The virtual pull and push, rise and fall, vibration and silence, dynamism and silence, leads to the formation of a structure within the soul. The structure is the result of apparent breaking of infinite symmetry. With all interactions always taking place in accordance with the fundamental forces that uphold them, structure is the result of the virtual distortion generated by the interaction of forces. The structure of the soul is traditionally recognized as bhava karma. This is broadly divided in two parts the psychical karma structure and the physiological karma structure. Both structures are though independent the psychical structure exists only when the physiological structure exists. The psychical structure constitutes nescience (ajnana), delusion and inertia (that obstructs manifestation of soul energy), and identifies the perverted state of the soul. The physiological structure forces the soul to have a physical form. This structure does not interfere with the psychic powers of the soul but prevents it to attain its natural state of eternal unchanging existence and formlessness. In the soul of the Omniscient the psychical structure is absent and the subject and the object is the same pure consciousness. In the impure soul the subject is the consciousness and the object is the virtual structure created by bhava karma. What is the form of this structure? We attempt here to study the psychical structure generated as a consequence of the cognition process, which is an inherent activity of the soul. We first define the terms knowledge and intelligence and then propose a model of cognition system that helps in identifying some structural concepts of the soul. Jnana was a means for the ethical progress of the soul in Agama period; it was one of the constituents of the path of Moksa. Jhana which did not help in Moksa was ajnana or mithyajnana (perverted jnana). The difference between jnana and ajnana was not objective but subjective. The cognition of a samyakadristi (soul having enlightened world view), whether logically correct or incorrect, was samayakajnana (enlightened jnana). Similarly, the cognition of mithyadristi (soul having deluded view) was ajnana. In the period of logic, jnana was defined as apprehending the reality. Jnana now became objective. Gautama: "O Lord! The soul is jnana or ajnana? " Mahavira: "O Gautama! The soul is jnana as well as ajnana, but jnana is positively soul. Thus both jnana and ajnana are part of the empirical soul. In the mundane existence of the soul the jnana is clouded by karma. Irrespective of the karma veil some jnana always manifests. The manifested jnana is divided in four classes based on its application, which depends on the intensity of the veil. When the veil is thicker the manifested jnana is known as mati jnana that takes help of senses and mind to cognize the object. The jnana is known as sruti jnana when the soul cognizes the object cognized by another soul. The sruti jnana needs mati jnana for its manifestation. When the karma veil is thinner the soul can directly cognize objects without the help of senses and mind. In this state the soul can perceive the objects which are beyond the range of senses and mind. These direct cognitions are of two types. Avadhi jnana directly perceives the external objects, as well as the self. Manahaparyaya jnana perceives the thoughts of other mundane souls. When the psychical karma veil is completely eliminated the pure jnana of the soul, kevala jnana, that can cognize the self in all its aspects as well as all objects, small and big, near and far, past and future, manifests. Darsana is awareness (to be conscious of) in short. Darsana is samyaka (right faith) if soul leans towards spiritual pursuits and believes in liberation as the highest goal of life. It is mithya (perverted faith) if the soul is engrossed in worldly pleasures. As far as the cognizer and the object are concerned the Jaina does not hold any difference between jnana and darsana. Darsana is devoid of judgment; it is more like awareness without any predication. Acaksu darsana - there are different views. The general view is that this is apprehension of the object through non-visual senses and the mind (some scholars have objections to mind as it has no darsana). The remaining 5 types of slumber (nidra) do not put any obstruction on jnana and darsana according to theory of karma but obscure cognition of details. Knowledge is the manifestation of intelligence of the jiva with respect to its comprehending capacity. The cognition function of jiva needs manifestation of both the jnana and darsana attributes. It is comprehension of the objects with their details. Intelligence may be held as an attribute, a manifestation of an attribute, an ever changing series of cognitions, a process, an activity and also as an entity in itself. These are the partial descriptions of intelligence, and may be found consistent in a suitable context. None of them taken absolutely can give a full picture of the jiva with respect to its intelligence attribute; all of them describe the same entity in various aspects. The process of knowledge is constituted by the momentary modes of the intelligence attribute, and so it may be looked upon as a series of cognitions. When these modes are perceived along with the unity of the attribute behind, intelligence may be considered to be a process. As an element in the structure of the jiva, intelligence may be seen to be a potentiality. It can also be held to be an activity if viewed in its functional aspect; knowledge is an activity of the jiva with respect to its intelligence attribute. If intelligence is considered in isolation from its substratum, it may be taken to be an entity in itself. The knowledge is the result of the cognition process. An object is supposed to have infinite aspects and to apprehend all the aspects at a time would need infinite power of cognition. Our normal cognitions are limited by the karmic veil, and we perceive and know only some aspects of the object. This makes our knowledge of the object incomplete. Incomplete apprehensions introduce an element of doubt about the object and the subsequent cognitions may be different from the previous ones. This is also true of all scientific observations, which elate to physical objects and are never complete because of the limitations of the observer and the instruments used in the observation. Each cognition outputs an element of knowledge which is added to the previous body of knowledge. The knowledge we have at any time is the sum total of the knowledge manifested by the soul in the long past. The soul has passed through innumerable (or infinite) modes in the past and had manifested knowledge in each mode. All that knowledge is present in the psychical structure of the soul. Some of the knowledge we have was acquired as one sense beings, some as two-sense beings and so on. Thus our present knowledge is a mix of knowledge acquired in different forms of soul existences. The principal source that colours our knowledge and makes it biased is deluding, mohaniya, karma. Like jnana and darsana obscuring karmas, the mohaniya karma is also a variable; it was at its highest in one-sense existences and gradually decreased in higher existences. Thus the colour of the manifested knowledge also changed from one life form to another meaning that each element of knowledge in store had a different colour at the time of its manifestation. The knowledge acquired as a human being in general is purer than the knowledge gained in the animal existences. By this logic we expect that the knowledge acquired by direct cognitions in case of avadhi jnana and manahaparyaya jnana is purer than the knowledge of souls, like us, having mati jnana and sruti-jnana. With the reduction in mohaniya karma the cognitions become purer and also closer to truth. Ajnana may be interpreted to have four meanings. Wrong knowledge. According to Jain logic valid knowledge (prama) means a decisive cognition of the self as well as the object. The wrong knowledge is known as samropa (false imposition) which has three type (1) samsaya (doubt) (2) viparyaya (illusion) and (3) anadhyavasaya (indistinct appearance). Darsana also is generally included in the last category; but anadhyavasaya stops with its flash of indistinct appearance, darsana later on develops into jnana. No demarcation line can be drawn between the right and wrong as far as incomplete knowledge is concerned. According to Jaina logic difference between truth and falsehood is not that of quality, but of degree. Perverted attitude. Jnana is samyakjnana (enlightened jnana) when it cannot be reversed, Jnana is ajnana or mithyajnana (perverted jnana) when it can be reversed. Jnana in itself is neither samyaka (enlightened) nor mithya (perverted), it is samyaka or mithya according to the attitude (dristi) of the subject, which is influenced by mohaniya (deluding) karma. Jnana may change according to the attitude of the subject. The knowledge of mithyadristi (possessing perverted attitude) is not held to be rational, and is ajnana. Absence of knowledge. The absence of knowledge is due to the veil of jnana and darsana obscuring karmas. These two karmas can be sarvaghatin (complete) or desghatin (partial). The jnana and darsana potential energies of the soul are supposed to manifest, under the cover of perception deluding karma that affects the cognition process. This manifestation can be regarded as a flow of soul energies that generates knowledge. The process of knowledge generation by cognition is considered similar to generation of power in a hydroelectric power station. In this type of power station water stored in a reservoir flows through a turbine generator system where a part of the potential energy of flowing water is converted into electrical power. The remaining energy flows to the river sink through the discharge water. If P is the potential energy input to the system and W is the electrical output then W=EP, where E is the efficiency of the system. The remaining energy (1-E) P is discharged to the river. In the case of soul, the jnana and darsana is the reservoir of energy and corresponding (bhava) karma acts as valve. The valve opens on ksayopasama of (bhava) karma. In the ksayopasama process, which is common and regular in all organisms, some portion of karma is subsided; some is eliminated while some is in the process of rise. The opening of the valve and the flow of energy of the soul depends on the ksayopasama level; it increases with ksayopasama of karma. Fig 1 shows the cognition process taking place in the soul. There are five valves of jnana obscuring karma and nine valves of darsana obscuring karma corresponding to the five types of jnana and nine types of darsana of the soul. We consider first the case when kevalajnana karmas are on rise and the avadhi jnana, manhaparyaya jnana and kevaljnana valves are closed. We also assume that avadhi darsana and keval darsana valves are closed. The slumber valves are closed in the wakeful state and open during sleep. This is the normal case applicable to all beings. It must be mentioned here that karmas veiling mati, sruti, avadhi and manahaparyaya jnana and caksu, acaksu and avadhi darsana are partial obscuring (desaghatin) and the karmas veiling kevaljnana, kevaldarsana and slumbers are fully obscuring (sarvaghatin). The partial obscuring karmas have progressive operation and the valve opening can increase or decrease based on the intensity of the veil. The fully obscuring karmas are of on-off type, the valve is either fully closed or fully open and there is no intermediate position. at any time t due to ksayopasama of corresponding karma. Both J and D together provide the energy for the cognition process. But before this process occurs, the darshana D passes through the filter of the rising darshana mohaniya (perception-deluding) karma and is coloured by this karma to a form Dp. In fact, it is Dp and not D that participates in the cognition process. Both D and Dp are of the same quantity but differ in quality. In the wakeful state both J and Dp participate in the cognition process. In the sleep state J is absent i.e. J = 0 and Dp consists of d2p only, i.e. D = d2p. The soul now perceives some part of the generality rather than the particularity of the object. It may be noted that in the mati jnana process j2 is zero, and in the sruti jnana process both j1 and j2 are non-zero. In both of these cases d1 and d2 are non-zero. The efficiency of the cognition process E depends on the ksayopasama level of the darshana mohaniya and antaraya (soul energy-obstructing) karma. The active antaraya karma offers resistance to the utilization of cognition energies, which also reduces the efficiency of the process. This means that only part of the manifested jnana and darshana energy contribute to the knowledge output of the cognition process. The knowledge output Ki is E (J+D). We assume that balance jnana (1-E)J and balance darshana (1-E)D flow to some kind of reservoirs in the soul and are reserved for future use. These energies remain unutilized for the time being (see delayed cognition below). The output knowledge is of the mati type if j2 is zero and of the sruti type if both j1 and j2 are non-zero. The output knowledge Ki is subjective because of the color imparted by the darshana mohaniya karma. Therefore, the output of knowledge from the cognition process is (1) only a fraction of what is possible with the manifested jnana and darshana energy and (2) subjective, i.e. perverted knowledge. The knowledge Ki passes through another filter of active charitra mohaniya (conduct-deluding) karma before it is stored in the memory bank. A bias of the passions and quasi-passions in operation at that instant is imparted to the cognition output. We have separated charitra mohaniya from darshana mohaniya in this model because the former does not participate in the cognition process. Note that the quality of knowledge is a function of darshana mohaniya karma, i.e. the knowledge of a mithyadristi, non-believer: and the knowledge of a samyakdristi, believer of soul, is differentiated. The mati jnana energy j1 should represent the soul's faculty of creative or intuitive thinking. This is manifested in the body through the senses and mind and suffers from limitations imposed by them. The sruti jnana j2 is supposed to represent the soul's faculty of rational thinking, including deductive and inductive reasoning. This is supposed to manifest with the help of mati jnana, i.e. j2 exists only when j1 is non-zero. The faculties of creative thinking and rational thinking together must constitute the intellect. The intellect thus is J= j1+j2 where j1 is creative intelligence and j2 is rational intelligence. Intellect is manifested jnana and is the power of the soul to comprehend the details of an object. Acaksu darshana (d2) represents the faculty of awareness manifested by the other senses. The total awareness faculty D of the soul is D=d1 + d2. The awareness coloured by darshana mohaniya karma, Dp, can be called perception which is subjective. The buddhi has a wide spectrum and includes a wide range of abilities and powers of the soul. Buddhi is the decision-making power of the soul and is biased by the active perception-deluding karma. The buddhi is at a minimum level in one-sense beings, where both J and Dp are considered to be at their lowest level. The level of buddhi increases in higher-sense organisms with a higher ksayopashama of obscuring psychical karma. It is relatively higher in human beings, than animals, which have a developed mind. Cognition is the intelligent activity of the soul and buddhi is the active force behind decision-making. The cognition output as knowledge has been coloured by mohaniya (deluding) karma. As long as mohaniya karma is in existence, the knowledge of the soul is subjective and perverted. Note that the value of J and Dp, and hence intellect and buddhi, are based on the ksayopashama of jnana- and darshana-obscuring karma and remain unchanged unless a change in the ksayopashama level takes place. In contrast to this, knowledge Kt increases with time because cognition is a continuous process. This is an important difference between intellect, buddhi and knowledge. Intelligence is an intrinsic property of the soul; it is beginning less and endless. Knowledge is acquired by intelligence; it has a beginning and an end and it can also be reversed. Intellect and buddhi cannot be acquired from outside; they can only be developed by the ksayopashama of intelligence and awareness-obscuring karma. Intellect and buddhi are not influenced by conduct-deluding karma. The ksayopashama of perception-deluding karma improves the quality of perception by reducing the colour. This is possible in all human beings whether they are a layman or an ascetic. Ascetics' ksayopasama of conduct-deluding karma is also high, so their perception and conduct are purer than that of laymen and their knowledge is relatively un-biased. Perception-deluding karma varies in cognition process. This means that each Ki is associated with a different perception-deluding colour. Perception-deluding karma acts independently of conduct-deluding karma. This implies that conduct should not be an essential condition for clairvoyance; rather, the essential condition for clairvoyance is the ksayopasama of avadhi jnana and avadhi darsana-obscuring karma. This can happen with both ascetic and non-ascetic individuals. In the presence of perception-deluding karma clairvoyance is biased and is called vibhanga jnana. When perception-deluding karma is eliminated in samyagdristi jiva, clairvoyance becomes unbiased and is called avadhi jnana. (3) knowledge, Kt, for memory and recognition. This is the psychical mind. It has a counterpart in the physical mind that is made of mano vargana. The physical mind works in conjunction with the senses and interacts with the external world. The two types of mind work in parallel and are related to each other by the rule of correspondence. The mind presents options and makes judgments; the decision is taken by buddhi. The buddhi, though part of mind, is independent of the conduct mohaniya karma and ajnana of the soul and is in a position to make decisions free of their influences. This means that a soul that is not highly placed with respect to conduct and lacking detailed knowledge of the world can also make good decisions in life. Education increases knowledge of the world and is supposed to enhance one's power of thinking and imagination  but education is not an essential condition for making good decisions. A less educated person can also make good decisions and may, in fact, lead a happier life than an educated individual. But buddhi usually follows the mind (manah), which is inclined towards worldly attractions, only the wise persons respect the decisions of buddhi. There is yet another category of persons who ignore the mind and buddhi and instead listen to the inner call, the antahapragya or intuitive faculty that motivates the soul to spiritual pursuits. Such individuals ignore worldly pleasures and decide in favor of the upliftment of the soul. This happens when the mind has been silenced so that the inner voice can be heard. Jainism classifies living beings into two categories: those endowed with mind (samanaska) and those without mind (amanaska). All deficient beings, with up to 4 senses, are not supposed to have mind. The level of buddhi in deficient beings is low, so they are not in a position to think and imagine. Also because their knowledge is limited, their memory is negligible. However, they do have a faculty of feeling and willing. From this point of view they have a mind, which in this form is known as instinct (or drive or urge) (samjna). Instinct is a natural faculty of all beings and is primarily the consequence of active mohaniya karma. We may regard instinct as an undeveloped mind. The mind in 5-sense beings has a higher level of buddhi, allowing for the development of knowledge; it can therefore be said that they are endowed with mind. We see above some of the roles of intellect and buddhi in the activities of the soul. These faculties of the soul in fact have multiple descriptions as was mentioned earlier. Consciousness exists at many levels, and the jiva's spiritual progress takes place from the lowest to the highest level. We exist at a level determined by our karma. The manifestation of a higher level of consciousness is prevented, according to Vedic philosophy, by ahamkara (ego). In the model presented here, the conduct-deluding karma colours the knowledge that is output by the cognition process. The passions, of which ego is one part, included in this karma compares to ahamkara. Conduct-deluding karma therefore obstructs the attainment of higher level of consciousness. When ahamkara is eliminated or reduced to a lower level, higher consciousness manifests. Active perception-deluding karma puts a label on the soul, in a way, so the soul considers itself branded. The worst brand is mithyatva, in which the soul considers itself to be only a material body and has no faith in a spiritual existence. There are two aspects of perception: perception of the self and perception of other souls. The perception of other beings is guided by the principles of upadaan, the main cause, and nimitta, the auxiliary cause. Our perception of another person depends on both our label and the label and performance of that person. So this kind of perception is a complex phenomenon that creates different perceptions of a given person depending on the person who is doing the perceiving. The buddhi is heavily influenced by ahamkara. Ahamkara corrupts the buddhi and prevents it from taking intelligent decisions. The thinking activity of the mind (manah) is affected by the ahamkara and ajnana. The thoughts of a common person are constricted by ajnana and biased by ahamkara and therefore describe only the relative truth. The soul cannot perceive the absolute truth with the help of mind. It is only when the mind is absent, with the elimination of psychical karma in the omniscient state, that the soul perceives the absolute truth. What is bhava? The term bhava is used in different contexts. It may mean mental feeling or refer to the overall state of the soul. Feelings are produced by the fruition of feeling-producing (vedaniya) karma. These feelings are influenced by passions, quasi-passions, and by vitality-obstructing (antaraya) karma. Therefore, bhava in this case can be described as the psychic state of the soul that is produced by the combined effect of feeling-producing karma, conduct mohaniya karma and vitality-obstructing karma. In this case bhavas are impure. When the conduct mohaniya and vitality-obstructing karma are eliminated in the omniscient state, the bhava are reduced to pure feelings. A liberated soul with no karma also has no feelings. Citta (Psyche) is another concept used in the psychological study of the soul. Citta is different from mind; it is supposed to be the controller of the mind. Citta is the consciousness of the soul working with the body; the mind is the instrument through which the consciousness of citta is manifested in the body. Mind is the working medium and citta is the working consciousness. The mind cannot be steadied, but citta can be in steady state. Different states of mind, such as concentration and unsteadiness, depend on citta. Citta is as permanent as the mundane soul, but the mind is temporary; the existence of the mind is need-based, so it is absent when not needed..
Citta is related to bhava karma; it is the state of the soul created by the incidence of bhava karma. Citta can be divided into three parts: adhyavasaya (spiritual vibrations), bhava and buddhi. These three parts work jointly or individually, depending on the function that is being performed by the soul. The transitory state of citta is due to psychical karmas; once these are eliminated in the omniscient state, the citta becomes calm and tranquil. In the non-omniscient state the citta can also be calmed temporarily through meditation and the suppression of passions and quasi-passions. The citta ceases to exist in the liberated state when all the karmas are absent. What happens to the earlier knowledge and memory bank in the omniscient state? Perhaps with the elimination of deluding karma this perverted structure is destroyed and the memory bank (ajnana) ceases to exist. The omniscient has no use of the previous memory: with its infinite intelligence the omniscient soul cognizes any object instantaneously without any thinking or bias. It experiences the absolute truth, which is revealed intuitively and spontaneously in its conscious mind. We mentioned above that the manifested jnana and darshana energy that does not participate in the current cognition process may be sent to reservoirs in the soul and stored for future use. When an occasion arises in the future in which the effect of antaraya karma is reduced and time is favourable, these dormant energies may suddenly affect the cognition process and generate new knowledge. This may be called delayed cognition. This is perhaps the reason that we sometimes get sudden insights without any intentional effort, in which ideas that may provide the answer to some problem we have been tying to solve are revealed to us. Such events provide a spark that may sometimes change our outlook and vision and the way in which we live. What is implied here is that soul energies are not wasted; if not used immediately, they may wait for the opportune time and occasion to produce some kind of result. This could be called intuition. Intuition, then, means the use of unutilized but processed soul energies to receive insight. This does not require further ksayopashama of karma; it takes place naturally on account of the efforts made in the past. The above model is a simplified representation of the cognition process taking place in common individuals. The model can be improved by accounting for the assumptions made. For example, in the next stage of research the role of passions and quasi-passions, which are parts of conduct mohaniya karma, can be modeled to study their role in the generation of knowledge. 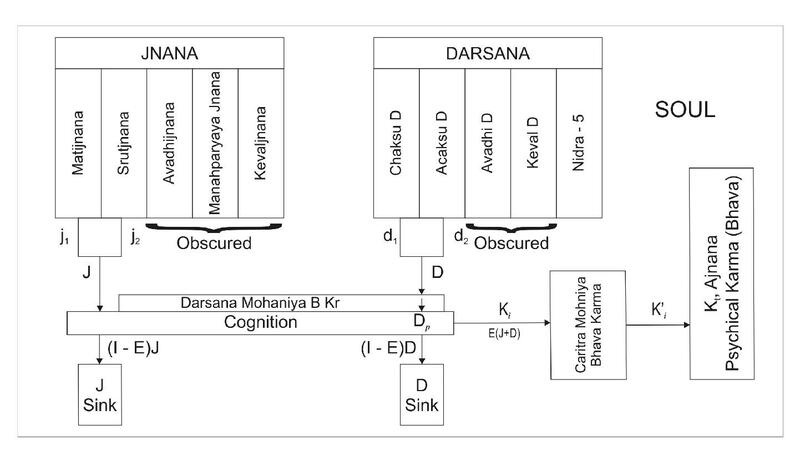 Jnana and darsana are two components of cognition process. Knowledge, which is seen as a structural distortion in the soul, relates to cognition of external objects. The cognition efficiency depends on the ksayopasama level of the perception mohaniya karma and antaraya karma. The knowledge is coloured by perception mohaniya karma and conduct mohaniya karma before it becomes a part of memory bank, ajnana. The model of cognition system presented helps in conceptualizing the (virtual) structure of the soul and identifying the effects of different psychical karmas on the cognition process and activities of the soul and defining the terms like manah, buddhi, ahamkara and bhava.